There’s no doubt about it, in today’s world, it’s business buyers not brands that are in control when it comes to the sales cycle. Through search and social media, they can get to choose how and when they engage with an organisation, what information they want, and in what format. And that’s not all: both search and social are changing fast, evolving with technology and in response to user preferences. It means that B2B brands and marketers face an increasingly difficult challenge when it comes to understanding how to engage with their audience and to allocate their marketing budget. 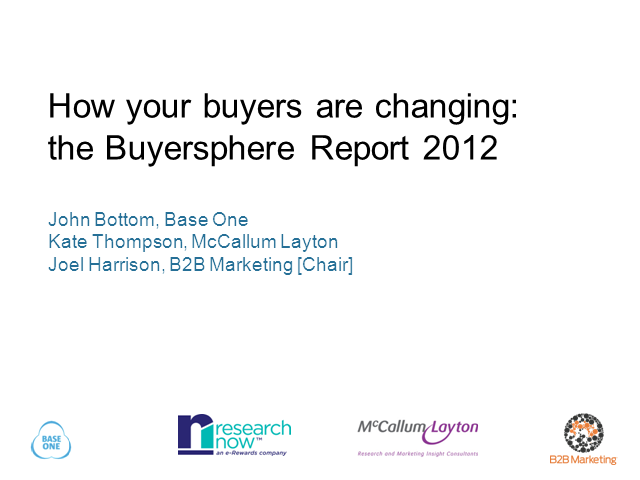 Fortunately help is at hand with the results of the latest Benchmarking Report, produced by B2B Marketing and Base One, with help from McCallum Layton and Research Now. This study provides unprecedented insight into business buyer behaviour and preferences across Europe, and could prove critical to marketers in ensuring that they are making the right decisions. • Which channels have most resonance for buyers.